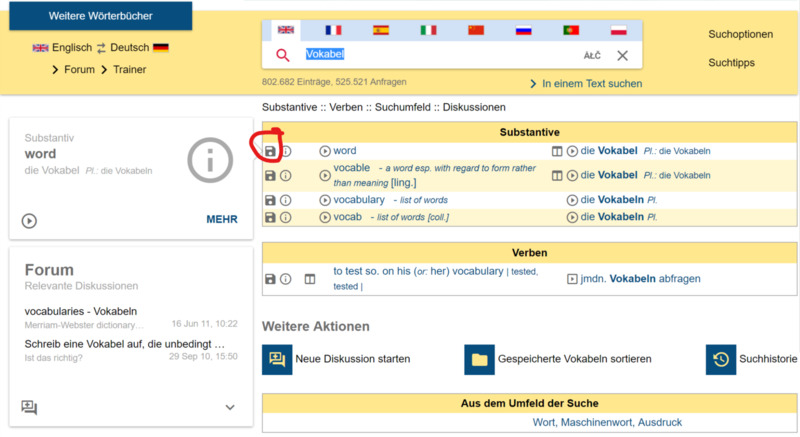 Sprachtrainer Step 1: How do I get started using the Sprachtrainer at Leo.org? Adding words to your list is easy. When you are logged in and you look up words in the dictionary, each entry will appear with a little diskette image at the left. Clicking that disk will save the word you looked up to your vocabulary list. Each night of assigned reading, your goal is end up with 20 new words on your list. You might want to start out saving every word you look up to your list (in order to reach the 20 word threshhold) and then whittle the list down to the top 20 that would be of use to you. Going over 20 new words might be too many to reasonably learn. Every three class periods, you will electronically submit a list of your 60 new words (20 from each session). This list will serve as the basis for your individualized vocabulary quiz. In the class following (the fourth class), Prof. Block will assess your vocabulary acquisition by passing out an individualized quiz to you with 10 of the German words from your list. Your task is to write the English of those words. Simple enough.